Transparency Market Research states that the competitive landscape in the global radiopharmaceuticals market is quite consolidated. The two top players operating in the overall market are Siemens Healthineers and GE Healthcare, as they collectively held a share of 70% in the market in 2015. Players are expected to focus on improving the quality of product and developing advanced technologies to stay ahead of the competition. Furthermore, players are also expected work towards mergers and acquisitions to acquire new methods of production and better product development in the near future. According to the research report, the global radiopharmaceutical market is projected to be worth US$7.4 bn by the end of 2024 as compared to US$4.7 bn in 2015. During the forecast years of 2016 and 2024, the global market is projected to surge at a CAGR of 5.3%. In terms of radioisotope, the global market is segmented into technetium-99, gallium-67, iodine-123, 18F, rubidium-82, yttrium-90, and lutetium-177. Of these, the technetium-99 segment held the dominant share in the global radiopharmaceutical market. As of 2016, this segment held a share of 50.3%. The growth of this segment will be attributable to the abundance of technetium-99 from molybdenum-99 at sources as the uranium radioactive raw materials deteriorate within the sources. The demand for 18F radioisotopes is also expected to gain momentum due to rising demand for cyclotron-based radioisotopes that are required for producing nuclear medicines and rapid advancements in PET and SPECT technologies. In terms of geography, the global radiopharmaceutical market is segmented into Asia Pacific, North America, Europe, Latin America, and the Middle East and Africa. 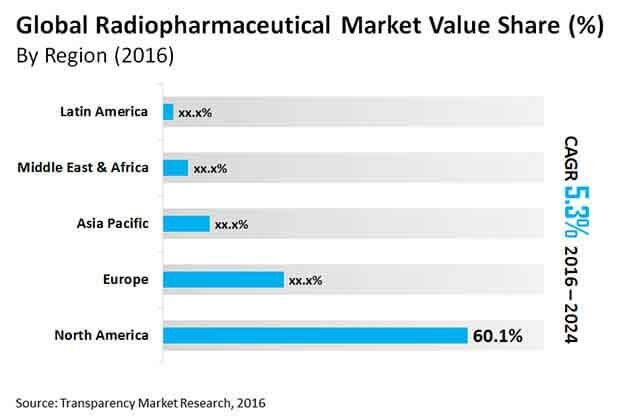 North America is expected to lead the global market in terms of revenue as the demand for radiopharmaceuticals grows in the U.S. The growing number of large nuclear reactors, which are instrumental in supplying the Mo-99 for production of nuclear medicine across the globe, are expected to spike the demand. The rising prevalence of cardiovascular diseases and cancer are expected to be the primary growth drivers for the global radiopharmaceuticals market. The growing pool of geriatrics, poor dietary habits, high prevalence of obesity, and unhealthy lifestyles are collectively responsible for the aforementioned diseases. In order to understand the damage these diseases and disorders cause gamma cameras or PET scans are used. Currently, about 90% of the radioisotopes are used for making these diagnostic device, while 10% are used for making radioactive therapeutic drugs. Thus, the increasing adoption of diagnostic devices screen the progress of these diseases is expected to have a positive influence on the global market. The headstrong market drivers in the global radiopharmaceuticals market are likely to be shaken up by a few challenges. The biggest restraint in the global market is the strict set of regulatory guidelines governing the production of radiopharmaceuticals. The market is also being restrained due to the paucity of radioisotopes, poor shelf-life of radiopharmaceuticals, and high cost of production.